Sunny days at the beach, laughter with friends, and smiles shared with those you love create indelible memories, but they don’t have to leave their mark on your face. Over time, the natural creases near your eyes that appear when you laugh or smile deepen and remain even when your face is at rest. They’re sometimes called smile lines, but they also have a less cheerful name: crow’s feet. While Botox is the go-to treatment for fine lines in the upper face, it’s not the only solution. With new treatments, it’s now possible to reduce the appearance crow’s feet without Botox. So whether you aren’t a good candidate for Botox or you’re looking for a different solution as a matter of preference, here are a few solutions to banish crow’s feet without Botox at Skin by Lovely. Your best solution for fighting crow’s feet without Botox depends on your age, skin type and other factors we’ll discuss during an in-person consultation. Below, you’ll find more information about how each treatment helps you win the battle against crow’s feet without Botox. Like Botox, Dysport is derived from botulinum toxin type A. The proteins in Dysport have a smaller molecular structure that lets the product diffuse readily below the skin. For trouble zones that have a larger surface area and thinner muscle structure, including the corners of your eyes where crow’s feet start, Dysport’s wider spread can be a bonus. If you’re used to Botox, you’ll also find that Dysport is more dilute. Therefore, you might need more units of Dysport. Both Botox and Dysport are FDA-approved. Whether you choose Botox or Dysport is mostly a matter of preference and your desired aesthetic result, though some patients will see better results with one over the other. During your consultation, we’ll go over every detail of the results you’re likely to get and how to achieve them. Do Dermal Fillers Work for Crow’s Feet? Fillers can help you get rid of crow’s feet without Botox, but they are most often used in very deep crow’s feet lines after Botox or Dysport have been injected. Botox and other botulinum derivatives work on the muscles underlying your skin and allow the overlying tissues to relax. Dermal fillers contain substances that are already in your body, including hyaluronic acid and collagen. They work by adding structural components back to areas of your skin that have lost them over time. This helps to plump up the skin, even subtly, to smooth out the appearance of lines and wrinkles. With a combination of site-specific products, we’re able to target crow’s feet precisely and fight the signs of aging on multiple fronts. If your skin’s just beginning to show signs of aging or needs a refresher to deal with fine lines, consider microneedling. Using controlled needle applications, we stimulate the skin to produce its own collagen in areas where it’s needed. Over time, your own body does the work for you, restoring your skin’s elasticity and creating a naturally youthful look. This technique is also compatible with other treatments, like Botox, Dysport, and dermal fillers. While the fillers add volume to deeper wrinkles, microneedling reduces superficial lines. A chemical peel can help erase some of the fine lines that may eventually deepen into crow’s feet. If you deal with uneven skin tone or rough texture as well as crow’s feet, a chemical peel might be for you. Peels range from mild alpha-hydroxy acids, sometimes called a “lunchtime peel,” to more intense treatments that renew skin at a deeper level. The best option will depend on your skin type, skin texture and personal goals. Retinol-based products are some of our best lines of defense against aging. Retinols and retinoids, both vitamin A derivatives, first became popular as a treatment for acne, but people quickly learned about its anti-aging properties as well. Today, we rely on retinols and retinoids for maintaining skin’s youthful texture and radiance. Retinols and retinoids stimulate cell turnover and regrowth, so they visibly improve overall skin texture within weeks. For getting rid of the beginnings of crow’s feet without Botox and smoothing away the last of your fine lines after other treatments, retinol could be your answer. Another advantage of these products is that they’re available for home use, so you can shop online for retinol products that work and care for your skin every day. Ready to Banish Crow’s Feet? Let your history be written in your heart, not on your face. With a little assistance from us, you’ll feel free to express yourself without worrying about deepening expression lines. Contact Skin by Lovely today and set up your consultation at either of our locations in Oregon or California. If you’re ready, book your appointment online so that you can start looking your best on your own schedule. When you choose FDA-approved treatments, products and experienced providers, you can enjoy more confidence in the final results. 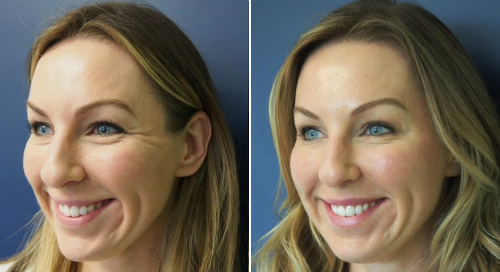 Learn how you can look more refreshed, yet natural-looking, in our Portland aesthetics practice. Our team is ready to help you rediscover your radiance. After five years of practice in one of LA’s busiest Botox clinics, our founder Lovely C. Laban, GNP-C established the first Skin By Lovely center for skin rejuvenation. For many years, our Santa Monica location has been considered among the top injectables practices in the nation. Find out why when you arrange a consultation with one of our providers and reveal a more youthful you.